Most people have spoken to Moneypenny. Few realise it. Established in 2000, we’re not simply the market leader. We are the biggest and fastest growing company of our type, handling 15m calls and chats annually on behalf of our clients. Our job is simple: to blow the socks off every single one of your customers. We do this by giving you the very best people, engaged in a happy working environment and inspired to deliver excellence on your behalf. And, there’s our gold standard technology – the result of continuous in-house innovation and collaborations with market-leading partners. Renowned for their knowledge and professionalism, our team delight customers both online and over the phone: you'd be happy to employ them yourself. We invest in our PAs, giving them the skills and knowledge to deliver exceptional service on behalf of our clients. It's infectious. 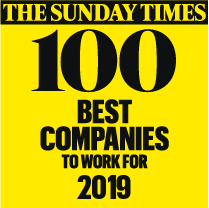 Our unique working environment (consistently recognised as a 'Best Company to Work For') inspires everyone to give 110%. This is the true value we deliver for clients. A qualified solicitor and former Moneypenny client with unparalleled knowledge of business development, Claire oversees our Sector Sales Team and Key Account Managers. Her closely-knit team work diligently with clients to implement tailored solutions that exceed expectations on service delivery. Ceri’s intimate knowledge of our culture makes for the effortlessly smooth running of daily life here at Moneypenny HQ. Tasked with maintaining our ‘small business feel’, she and her team nurture the positive and proactive attitude that’s now synonymous with being a Moneypenny PA. Being a recruitment client herself armed Lisa with a unique insight into the needs and wants of SME clients. As our former Sales Manager, today, she heads up a team of over 25 team members, dedicated to advising and supporting businesses of all sizes as they start their journey with us. Lynn is very special to us. Why? Because she’s our first ever PA, who now looks after anyone who comes to visit. This includes new PAs. From the day they arrive for their interview, to the day they graduate as fully fledged PAs: she loves being part of their journey with us. Now a Team Manager, Tina joined us in 2005 and has been adored by both staff and clients alike ever since. She loves building relationships with her clients and when she’s not helping her team, she’s organising charity fundraisers as a member of Raising Pennies – she truly is amazing! Even though he's only on a call for a few minutes, Zack’s aim is to make a positive difference in every caller’s day. Making callers feel special is what he does – and he does it brilliantly. Despite only starting in 2016, Moneypenny would be a poorer place without him. Leonie has been a Moneypenny gem since 2003, and as one of our wonderful Team Managers, she’s all about team life. Leonie likes nothing better than organising monthly team lunches and always gets stuck in with competitions to win her team fun days out. Someone who always has a smile on their face, Rhian is a well-respected PA who enjoys the endless variety of calls she takes. Whether it be helping someone book a property viewing or arranging a children’s birthday party, she loves how every single call is different. A champion of our culture, Ben is passionate about delivering excellence on behalf of his clients. It's why, as a Team Leader, one of his key priorities is to ensure his team have access to endless amounts of support and care whenever they need it. Team Leader Lauren goes the extra mile in everything she does. Whether it’s helping a client solve an issue or going above and beyond for her teammates; for her it’s a hugely rewarding job. Her support is greatly appreciated, not only by us, but by her clients too. A state-of-the-art building that inspires our people to deliver excellence.